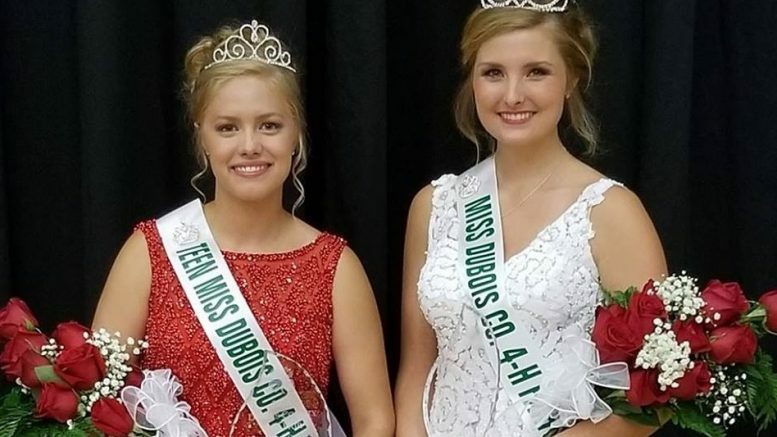 Royalty has been selected for this year’s Dubois County 4-H Fair as the 2018 queen and Teen Miss contest was held Sunday afternoon at the Jasper High School Gymnasium. Nine girls ages 17 to 21 competed in the queen contest. First Runner-up was Louisa Nino, a 2018 graduate of Southridge High School and the daughter of Judy and Primitivo Nino of Huntingburg. Second runner-up was Bailey Barrett the daughter of Scott and Carla Barrett of Huntingburg. A graduate of Southridge High School Bailey attends the University of Southern Indiana. Third runner-up was Elizabeth Huebner the daughter of Allan and Linda Huebner of Jasper and a graduate of Northeast Dubois High School now attending Indiana State University. Two young women was chosen for Miss Congeniality. They include, Colleen Hopf the daughter of Jerry and Debbie Hopf of Huntingburg. A graduate of Jasper High School, she is attending the University of Southern Indiana.And Brianna Lammers, a Southridge High School graduate now attending Purdue University. Her parents are Brian and Ann Lammers of Huntingburg. Miss Photogentic went to Olivia Brames, a 2018 graduate of Forest Park High School and the daughter of Matt and Glenda Brames of Huntingburg. Only three girls ages 14 to 16 competed in the Teen Miss Contest. Chaney Barrett the daughter of Scott and Carla Barrett of Huntingburg and a junior at Southridge High School was is the 2018 Teen Miss. First runner-up was Jaclyn Haug, the daughter of Al and Tammy Haug of Ferdinand. She will be a junior at Forest Park High School in the fall. Second runner-up was Leah Wilmes. The Forest Park junior is the daughter of Gregg and Kathy Wilmes of St. Anthony. The 2018 Dubois County 4-H Fair will be held July 16th through the 20th at the Dubois County Fairgrounds along Highway 162 near Bretzville. Be the first to comment on "DUBOIS CO. 4H FAIR ROYALTY SELECTED"